Hyperscale refers to an architecture which expands and contracts based on the needs of the business. This scalability involving a robust system with flexible memory, networking, and storage capabilities. As the growth in number of users and business sign ups for software services and content delivered over the internet or private networks are increasing, massive data centers designed to deliver services is ballooning.These ‘Hyperscale’ datacenters have been able to provide unmatched scalability to the massive succinct resources. 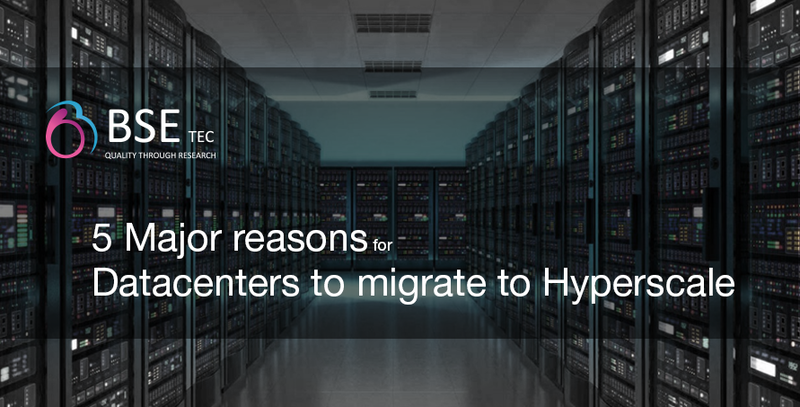 Here are the 5 Major reasons for Datacenters to migrate to Hyperscale. The top growth of cloud computing and Big Data signifies it’s major role for Hyperscale datacenters. According to a recent Cisco Global Cloud Index (GCI) survey, Hyperscale data centers will grow from 338 in number at the end of 2016 to 628 by 2021. They will represent 53 percent of all installed data center servers by 2021. 94 percent of workloads and compute instances will be processed by cloud data centers. Cloud and Big Dara would store 1.3 zettabytes of data. The survey also predicts that overall, east-west traffic (traffic within the data center and traffic between data centers) will represent 85 percent of total data center by 2021. As the technology continues to evolve at an extremely rapid pace, IoT is redefining the gamut of this evolution. According to Gartner, Inc. Gartner estimates that the IoT will include 26 billion units installed by 2020, and by that time, IoT product and service suppliers will generate incremental revenue exceeding $300 billion, mostly in services. The Rise of User-Generated Data and enormous data generated daily by enterprise applications, gaming apps, healthcare devices,sensors etc. It is always a challenge to build a secure and scalable storage to compute, network the resources, transform and process these data. And this is where ‘Hyperscale datacenters’ help the companies to bring up the high quality performance, security, consumer privacy, high availabilty and to implement advanced analytics on IoT data. The ease of deployment, the ability to add more computing power and with energy efficient operational qualities, ‘Containers’ make cloud workloads independent. Tools like Docker or Kubernetes taking the lead in this path. Concepts like Cloud Native Computing upbrings the development of distributed applications on the cloud. Containerized designs form a long data hall as they expand and along with Cloud Native enables the application to scale-out massively making a way for datacenters to compute and store huge amounts of data. Hyperscale cloud has been developed by the Internet giants to support the software services at a blistering speed. With Hyperscale, there are obvious improvements in performance and efficiency. Major organizations that effectively utilizes Hyperscale infrastructure for their business processes will see major raise in terms of efficiency. At present, Software is at the heart of innovation. To support a platform that provides a reliable, continuos and scalable software services Internet giants developed “The hyperscale cloud”. There are nearly 400 Hyperscale datacenters across the world and US accounts for almost half of these Hyperscale datacenters. There is a high demand for these in emerging markets like India. To provide cost-effective, scalable and available services, this is a significant opportunity for cloud services and all the infrastructure providers to invest in ‘Hyperscale datacenters’. Organizations involving in maintaining User-Generated Data, Enterprise applications, gaming apps and healthcare must utilize the strength of Hyperscale datacenters to mine massive data sets, build powerful insights and improve overall business structure and performance.